Biomechanics from TU Graz are developing surgical screws from donated human bone material for foot and jaw surgery in a FFG-funded project together with surgebright, a start-up from Linz. To heal broken bones using medical help, the surgical method of choice for decades have been metal screws, mainly made of titanium or stainless steel. During and after the healing process, these metal screws are seen by the body as disturbing foreign bodies and often have to be removed in a further unpleasant surgical intervention. Together with TU Graz’s Institute of Biomechanics, in 2013 orthopaedist Klaus Pastl developed an alternative in orthopaedics and accident surgery: the “Shark Screw”, made of the specially compact and hard middle layer of the human thigh bone (femur). So what exactly are the advantages of screws made of donated bone material? The metal doesn’t have to be removed and a second operation – as unpleasant as it is risky and expensive – doesn’t have to be carried out because the donated material has completely healed into the bones. So well healed that the transplant is no longer visible in an x-ray after one year. On top of this, the body recognises the bone screws as belonging to its own body, and danger of infection and complications is reduced to a minimum. 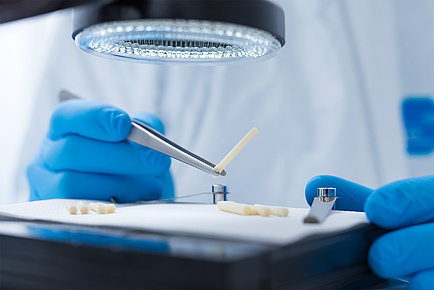 The Shark Screw is being produced from the start-up surgebright, which was founded in 2016, in cooperation with the German Institute for Tissue and Cell Replacement (DIZG) in Berlin. The patented technology is already being used in 14 Austrian hospitals. The design of the thread of the screws alone has an enormous effect on the bending and shear strength and breaking torque. In an initial step, researchers have to investigate and understand the forces active in the bone structure of the foot and jaw using laboratory measurements and simulations. When the parameters for the optimum strength of the screw are defined, such as the inner and outer thickness of the thread or the radius of the thread grooves, the bone screws will be subject to real tests based on DIN standards. “In general there is a big difference between working with metal screws and screws made of biomaterial. 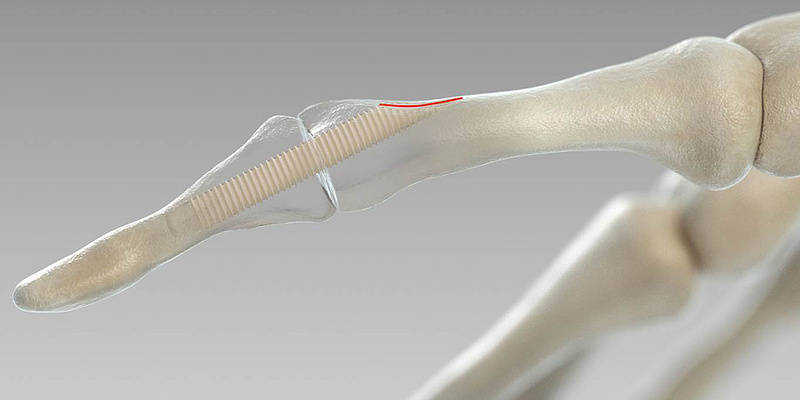 The mechanical principles are the same, but we also have to consider that donated bone material shrinks somewhat during sterilisation and two hours after the operation expands again in the body and becomes more elastic. For this reason, we are carrying out extensive investigations and tests – both in dry and rehydrated states,” explains Sommer. The starting material is also crucial. The donated bone material comes from organ donors and is only allowed to be used after strict selection procedures and serological screening. Not all donated bone material is suitable for the production of bone screws. What is pivotal is the size of the Haverian canals; these are canals in the cortical bone which blood vessels and nerves travel through. The basis for the preselection of bone material was worked out using electron microscopic investigations at FELMI-ZfE Graz. This research topic is anchored in the Field of Expertise “Human & Biotechnology”, one of the five strategic research foci at TU Graz.